The Frederator Studios Blog: My Life as a Teenage Robot. Postcards, Series 5. 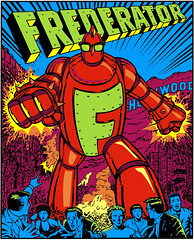 Frederator's been sending out promotional postcards for seven years now. In this latest series, we've limited each edition to 200, which means that no one usually receives more than 1 out of three (the mailing frequency is about every 10 days). So we're using the blog and our website to post the entire series. The latest set comes from our production of My Life as a Teenage Robot. The third spin off from Oh Yeah! Cartoons, Robot was created by Rob Renzetti, one of the most talented of the new breed that came into the business in the early 90s and saved the cartoon industry from itself. (Rob was a key creative player on Dexter's Laboratory and The Powerpuff Girls before moving on to his own originals.) Check out the Teenage Robot series blog. With these postcards, we wanted to showcase the stunning art direction of Robot, led by Rob and his art director, Alex Kirwan. Here's a model sheet, the logo style guide, and a couple of storyboard panels (ultimately, it's about loving the characters and the stories).